With thanks to the Crawford Fund in Victoria, Mr Nima Norbu travelled from Bhutan to Australia on a two-month training visit. Bhutan, a small kingdom nestled in the Himalayas between India and China, relies heavily on livestock production and in particular dairy cows. Large portions of land in this mountainous region are only suitable for the raising of livestock, thus making high-production dairy cattle essential to the growth of Bhutan’s agricultural industry, living standards and food security. 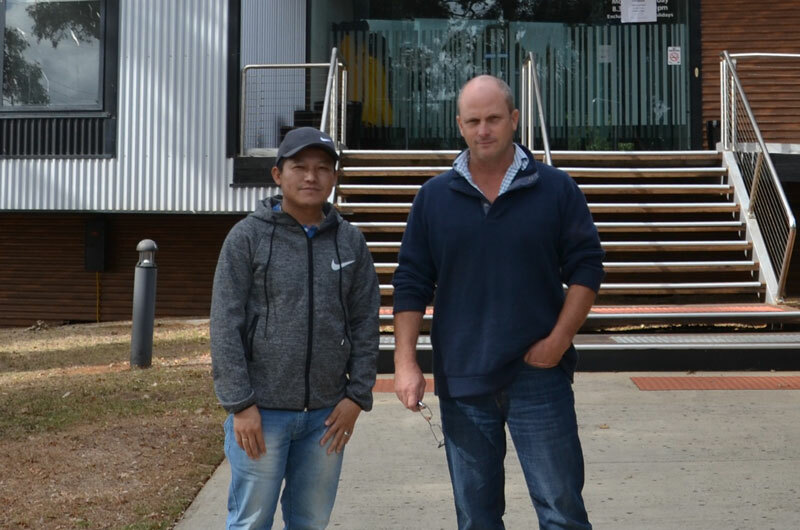 Mr Nima Norbu, a livestock production officer from Bhutan’s Ministry of Agriculture and Forestry travelled to Australia recently to work alongside Agriculture Victoria researchers in West Gippsland and researchers at La Trobe University. Under the guidance of Senior Research Scientist Dr Martin Auldist and his colleagues from the Agriculture Research Division in the Department of Economic Development, Jobs, Transport and Resources (DEDJTR) Ellinbank facility and Dr Markendaya Jois from La Trobe University, Mr Norbu’s training involved developing knowledge about increasing dairy cattle production with an emphasis on the nutrient needs of high producing dairy herds. Part of Mr Norbu’s visit to Australia included a trip to La Trobe university’s laboratories where he learned best practices for nutritional analysis and had the opportunity to discuss current research regarding the improvement of dairy cattle nutrition and production. In addition, Mr Norbu had the opportunity to visit working dairy farms in the Victorian region to see first-hand the workings of Australian farms and how current research has informed their practice. The training at both the Ellinbank facility and La Trobe university allowed Mr Norbu to gain exposure on an international level and undertake practical hands-on training, while also improving his English. The knowledge and skills developed during his time in Australia will be utilised to help develop and support a viable dairy industry in Bhutan with the support of a network of researchers and farmers here in Australia. “When I return home, I will apply the knowledge gained in Australia to my work in Bhutan. This knowledge will assist me to develop nutritional strategies suitable for application in the field. The opportunity for collaboration has been invaluable,” Mr Norbu said. Mr Norbu is well positioned to share his knowledge about dairy cattle nutrition with colleagues and farmers and expects to see an increase in production and resulting living standards for Bhutanese farmers and their communities.